Salveois a Latin word that means "to be well" or“being healthy”. This is indicative of the vision of the company, it’s the commitment to provide cure from the sufferings of the mankind by providing allopathic products of international quality at an affordable price. Our logo, a rising sun symbolizes the birth of a new pharma company that will provide service in the field of healthcare. The rising sun also represents the fact that, as a company, we will provide the necessary energy, seek the best from different sources, and integrate them under theSalveobrand, keep evolving and growing. Salveo Lifecarecame into existence in 2008 with the objective of profitably marketing allopathic medicines through direct marketing of its products and through its channel partners. The company has its operational office at Zirakpur and is managed by a group of professionals having experience of handling pharma business for more than 30 years. The products ofSalveo Lifecareare well established molecules in the various therapeutic segments viz.Anti-infectives, Anti-Ulcerants, Pain management-Analgesics/Anti rheumatics/anti-inflammatory, Nutritional and health supplements, Anti-oxidants/Multi-vitamins, Anti-asthmatics, Cough management, Haematinics, Anti-allergics, Digestive enzyme, Anti-osteoporotic, Prebiotics-Probiotics sachets and capsules, Ear-drops, Neuro-protectives, Hepato-protectives, Anti-diabetics, Cardiac care, Neuro-Psychiatry, Cardiac care. Salveo Lifecareis the main flagship company and has other divisions namelyNuphoric Lifesciences and Progenica Biopharma. The products of Salveo Lifecare and its divisions have been thoroughly tested on various parameters and manufactured atGoodManufacturing Practices (GMP)/ISO 9001:2000/ ISO 9001:2008 certified units. Since the time of our inception we have been engaged in the making of Chlorpheniramine Maleate, Phenylephrine Hydrochloride Syrups. These products are available in various quantities as per the requirements of the clients. These products are tested by the our skilled and trained professionals as per the international standards of quality. We are also engaged in the manufacturing of a gamut of Bromhexin HCL, Guaiphenesin & Menthol Syrup. We can also provide a customized quantity of these products as per the requirements of the clients. We also have the experience to tests these products as per the international standards of quality. •Each 5 ml contains: Terbutaline 1.25mg, Bromhexin 4mg, Guiphenasin 50mg, Menthol qs. 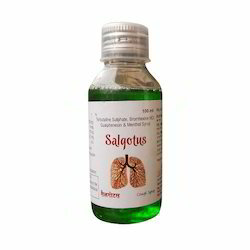 •: It is used mainly as a bronchodilator to relieve constriction of the airways in attacks of asthma and to alleviate wheezing and breathlessness in bronchitis and emphysema. •Bromhexime HCl: Bromhexine is a agent used in the treatment of respiratory disorders associated with viscid or excessive mucus. •Guiphenasin: Guaifenesin increases the volume and reduce the viscosity of tenacious sputum and is used as an expectorant for productive cough. 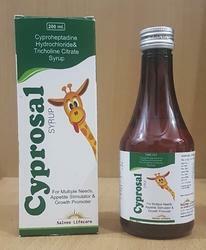 This syrup having Cyproheptadine and Tricholine Citrate helps revive appetite. Cyproheptadine is a serotonin and histamine antagonist with property. It finds clinical application in stimulating the appetite and growth. The appetite stimulating effect of cyproheptadine is probably a consequence of serotonin antagonism. It antagonizes the satiety stimulating effects of serotonin on the satiety center. Weight gain has been observed with cyproheptadine can be attributed to an interference with regulation of the secretion of growth hormone. Tricholine citrate in this combination contains three molecules of choline. Clinical interest in choline centers on its lipotropic action its utility in the treatment of fatty infiltration and cirrhosis of liver. Choline converts fat into phospholipids like, lecithin, which is essential to biomembrane structure and its function. Lecithin is also a major component of high density lipoprotein (HDL), and is used to mobilize cholesterol from cell membrane. Indications: It stimulates appetite, provides effective hepato-protective action, ensures weight gain, and enhances protein synthesis. It is indicated in Hepatobiliary disorders associated with Anorexia resulting in Weight loss. Desire for taking food is controlled by a center in the hypothalamus lateral hypothalamic area (Appetite center). There is another center ventromedial hypothalamus called satiety center. When stomach is empty, the blood sugar level is decreased, the message goes to the brain and Appetite center is activated and hunger is felt. After intake of food when appetite center is satisfied with the amount of food appropriate to calorified requirement, serotonin (a neurotransmitter carrying message to satiety center) stimulates the satiety center and appetite is lost. In case of anorexia, the level of serotonin is high. This activates the satiety center and results in the suppression of appetite center and loss of weight. Cyproheptadine: Cyproheptadine, an anti allergic drug with anti-serotonergic activity first came in the world of medicine as a drug for the treatment of pruritis and other allied conditions later on it was recognized as an appetite stimulator. It was found that serotonin, the neurotransmitter is one of the responsible factors to activate satiety center due to which appetite is lost. Cyproheptadine is a 5-HT antagonist and hence inhibits the action of serotonin or activation of satiety center and hence appetite is revived. Tricholine Citrate: It is a lipotropic agent. Tricholine helps to deplete fat accumulation in the liver. Thus Tricholine citrate is a hepato-protective agent. Tricholine citrate also increases appetite and spares methionine for body building. Tricholine also increases hepatobiliary flow resulting greater availability of bile in our GI tract. Increases fat emulsification, transport and utilization. ● Take this medicine under medical supervision. ● May cause drowsiness, do not drive or operate machinery, if affected. ● Pregnancy Lactation: Because of the higher risk of antihistamines in newborns and prematures, antihistamine therapy is contraindicated in nursing mothers. Storage: Store in cool and dry place. Protect from direct sunlight. Looking for Leading Pharma PCD Company ?